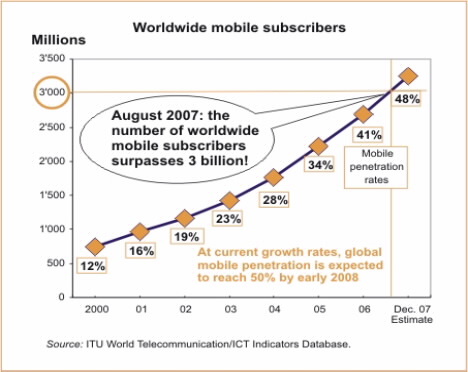 Mobile phones are perhaps the best example of the leapfrogging technology in the developing world. Internet usage has grown every year worldwide since the internet was born, but now that communications infrastructures have caught up in many countries, many of these new users will be accessing the web through their phones. Many companies are already trying to leverage mobile phones to expand their markets, such as M-PESA for mobile phone based payments, Assured Labor for hiring short-term contractors, or Jott for personal productivity. Banking customers can now check balances via text message. Patients of some hospitals can receive appointment and prescription reminders via text message. 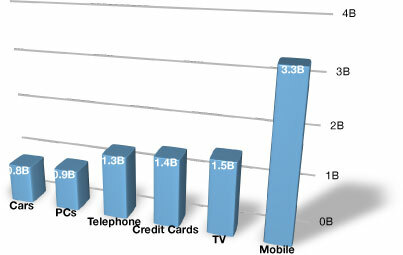 Integration of cell phones into business strategies is still new and companies have just begun to explore this. We are going to see a lot of new companies spring up, especially in countries like China and Brazil where cell phone usage is high but computer-based internet access still relatively low.